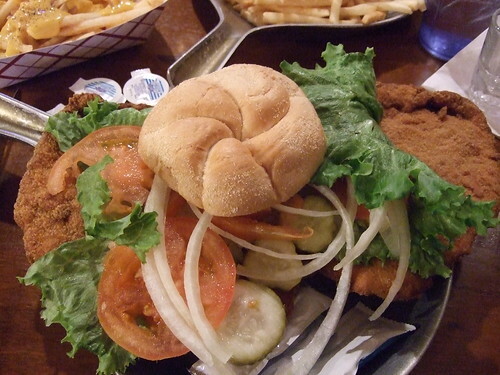 Looking to get a list together of place's that serve up GOOD breaded tenderloin sammys in Chicago and the suburbs. I dont know of any around me that I can recomend. And pleeze no cluvers and burger king type of places. I havent heard of even an acceptable pork tenderloin sandwich East of route 47. Checkout the beyond Chicago area, lots of posts about this sandwich there. PM me for specific places if you want. Ceres on Jackson in the board of Trade building. They serve a pork tenderloin plate lunch with potatoes, gravy and a side dish or two including roles and butter. You can also get it as a sandwich which I have never had, just the plate lunch. Its very good. Huge portion. There was a place on River Road a log time ago that served a BPT sandwich called The Porky. The piece of meat was the size of a dinner plate and served on a small bun. Pretty funny if you asked me. My favorite toppings? BBQ sauce and raw onions. I have not seen this locally since. You can find it at the Iowa State Fair in August. I was bodily reminded this weekend that Laschet's can make just about the best breaded cutlets in the city; chicken or veal, the meat is so good and tender, the breading so butter-crunchy and light, and you can get spaetzle and just forget about the bread. I have seen pork schnitzel as a special, but it's not on the regular menu. Asking Cemitas Puebla for a milanesa - hold everything but the meat - would honestly get you close with some damn good pig and bread at a kinder pricepoint. Beyond that, for actual Midwestern fried tenderloin sandwiches I believe board expert Davydd liked Archview, which superficially reminds me of old high school haunt Kopper Kitchen in Elmhurst, which also has a BPT sandwich on the menu. Blackberry Inn at the corner of Route 47 and Main Street, just west of Batavia, makes a pretty good BPT as well as a darn good reuben. Burgers must be good too since they call themselves "home of the belly buster". This is a small bar with maybe 8 tables but patio service in nice weather. OH NO!!!!!! I went to college in northern Iowa, home of everything pork and were the BPT was a frequent menu item. The only way to eat them was with mayo and sometimes mustard. Anyway, Blackberry Inn, just west of Batavia on Main Street and Rte. 47 has a pretty good BPT amongst other things. Just my personal preference. I know all about the mustard. I'm from West Central Illinois where every burger joint, bar, and bowling alley serves a tenderloin sandwich, and there ain't no such thing as a standard condiment list. Most places just offer the same options they'd offer for a burger (ketchup/pickle/onion/mustard and maybe mayo/lettuce/tomato if it was that kind of place). I usually either got it plain or with pickles and mustard. BBQ sauce and onions wouldn't be my choice either but I don't see anything wrong with it if that's what you like. Santander wrote: which superficially reminds me of old high school haunt Kopper Kitchen in Elmhurst, which also has a BPT sandwich on the menu. Use to live out that way in Villa Park. Thanks for the heads up on this one! Have you had the BPT sammy there recent or back in the day? Likestoeatout thanks for the tip to Blackberry Inn. $6.95 Lightly breaded Frisbee on a Bun. Last edited by Cbot on May 17th, 2010, 10:02 am, edited 1 time in total. The Silo is Lake Bluff has a pretty respectable version. Ive had Blackberry Inns tenderloin, not bad. However their hamburgers are their main attraction imho. Morris(R Place, Rockwells), Ottawa(Del Torres), and the king of the tenderloin Smitty's in Leonore arn't that much further. And the declension of "condimentation" is fricatively cromulent. Lindy Gerty's offers breaded pork tenderloin sandwiches, though I can not attest to the quality at the current locations the sandwiches I enjoyed in years past at the now closed Ottawa, IL location were pretty tasty. If you accept pork schnitzel as an acceptable substitute the Bavarian Lodge in Lisle only uses pork in their schnitzels and are quite good. Here is an ambitious catalog of breaded pork tenderloin goodness, I think there is only one or two Illinois entries. At least it's a feast for the eyes. I always thought it odd that tenderloin sandwiches are so difficult to find within the city limits. 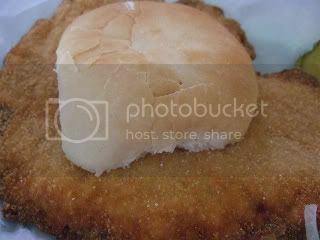 I'm talking about Iowa/Indiana style: a ridiculously large and thin breaded tenderloin on a small bun garnished with sliced raw onion, dill pickle slices and a variety of condiments (often mustard and/or mayonnaise). I can't say their absence bothers me too much as I'd usually rather have a good schnitzel without the bun. Resi's Bierstube has rarely let me down (they also serve schnitzel in sandwich format, though I haven't tried one) and for takeout I like Troha's (since 1920). Santander wrote: Beyond that, for actual Midwestern fried tenderloin sandwiches I believe board expert Davydd liked Archview, which superficially reminds me of old high school haunt Kopper Kitchen in Elmhurst, which also has a BPT sandwich on the menu. I don't know that Archview serves the tenderloin sandwich we're looking for. Even for an open-faced, gravy-soaked version I can't recommend them. Here's one I had there over three years ago (with no desire to return). Not a single ingredient on the plate was above average but that gravy would have killed even a great sandwich. In my mind (and to hold to the Iowa standard) it would have to be pounded thin and a big as a plate. Most local restaurants serve a patty that is just too thick. There was a mention of a tasty Indy-style pork tenderloin sandwich on the Clutch thread two months ago. If it's still on the menu, it looks to be worth checking out. If Rockford is in the realm of possibilities, I happen to be especially fond of the breaded pork tenderloin sandwich at the Machine Shed. pamiam wrote: There was a mention of a tasty Indy-style pork tenderloin sandwich on the Clutch thread two months ago. If it's still on the menu, it looks to be worth checking out. wino66 wrote: March 13th, 2010. I stopped in for lunch recently and even though they haven't finalized their new, expanded menu, I tried one of the specials that will find a home on the new menu. Sure looks good, now thats what I am talking about and looking for! And a tall glass of FINE Bells brew! Nice NICE NICE! Always wondered why there was no wiener schnitzel on the menu at Wienerschnitzel. Maybe that's why they never made it big in the Midwestern market. Used to be one, now long geschlossen, near my house on the west side of Champaign. jimswside wrote: Smitty's is fast becoming one of my favorite places to eat out in Lasalle County. I have made 2 visits this week, once for wing night(the best wings I have eaten), and last night to try their all-you-can-eat fish night. My wife ordered the fish special, which comes with salad bar, and the fish & french fries are served as on a buffet tavle, not cooked to order. The walleye, and cod were good. I ordered an 8 piece jumbo shrimp platter for my daughter(served with fries, and cole slaw), and I ordered the highly touted pork tenderloin sandwich, and some cheese fries. The tenderloin sandwich is massive, and the best I have tried anywhere. The tenderloin is easily 3-4 times the size of the bun, and cooked perfectly. I ordered mine with lettuce, tomato, pickle and onion, and there were about 6 slices of tomato, lots of lettuce, picles, and sliced white onion as well. The cheese fries were a hit for me as well, so basic, but they really hit the spot last night. Total bill with 2 Miller High Life lites, and 2 shots of tequila....$29.00 before tip. Open for lunch Mon- Sat, and open @ 1:00 p.m. on Sunday. They serve lunch from 11:00 to 1:00, and have specials pretty much every night. Tues & Thurs are wing nights, etc. & they serve broasted chicken on some nights. Wow Smitty's looks and sounds top shelf! Good place to hit next time around the Starved Rock area. I had the schnitzel at Resi's a couple of weeks ago and thought it the platonic ideal of the dish. Really terrific. The lunch counter at the bowling alley in downtown Ottawa, Illinois... and stop by Polancic Meat Market to buy them, or Handy Foods to pick up up Polancic's pork tenderloins frozen. My Mom grew up in Ottawa and these were a treat when we went to go visit my grandparents. Now they're up here in Chicago, but I've dragged my wife into Ottawa for tenderloins on the way to Starved Rock. 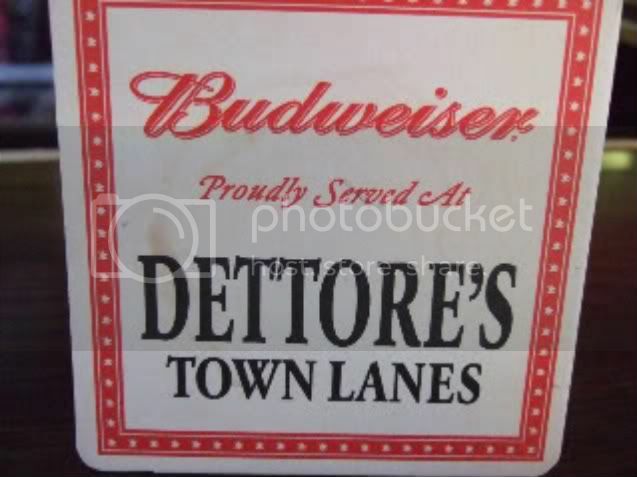 blipsman wrote: The lunch counter at the bowling alley in downtown Ottawa, Illinois... .
Detorre's town lanes, not a bad version. hmm.. perhaps a tenderloin crawl is in the cards. JimTheBeerGuy wrote: Sign me up! perhaps later in June or July once my schedule gets less bbq crazy. I've long thought so/said so as well. Resi's is one of the great not-yet-GNRs, up there with Tierra Cliante (was C. Leon). It's a tremendously consistent place. The bread basket has suffered with the closing of Baltic Bakery, and I wish they'd replace the rye with a similar product from Racine, but that's a minor quibble. The schnitzel is great. NB: they have offered spaetzle recently -- blurring menus with Laschett's in an area where they used to (seemingly) leave certain dishes to the local rival. I didn't think the Resi's spaetzle was up to Laschett's standard (too small, for starters), though I prefer Resi's potatoes (fried, salad, pancackes) to just about any starch in Chicago. The guy in Resi's kitchen knows how to fry stuff in butter.